When Ines (Alida Valli), the girl friend of condemned insurrectionist Fernando (Gerard Landry), pleads for her lover's life, Don Blas shows mercy--if Ines will agree to marry him. Theirs is a hate-hate relationship until, unexpectedly, Don Blas shows himself to have a glimmer of humanity. Now in love with her husband, Ines is in a quandary when Fernando re-enters her life. Les Amants de Toledo was filmed in four different versions: French, Spanish, Italian and English. The cast, however, remained constant throughout. Pedro Armendariz stars as Don Blas, the seemingly corrupt police chief of Toledo, Spain. 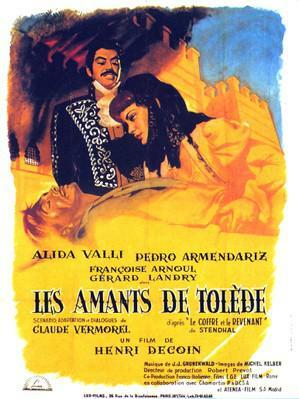 Filmed in early 1952, the English-language version of Les Amants de Tolède, retitled Lovers of Toledo, was made available in the U.S. the following year.